Cities are centres of resource consumption and urban resource use has a considerable influence on both the economy and the environment in the resource-providing hinterland. This chapter looks at cities from a socio-ecological perspective and investigates the evolution of the energy metabolism of the city of Vienna since the beginning of industrialisation. Based on time series data on the size and structure of energy consumption in Vienna in the period from 1800 to 2006, it analyses the energy transition and how it relates to urban growth. It shows that during the last 200 years, a multiplication of energy use and a shift from renewable biomass towards coal and finally oil and natural gas as the dominating energy source have been observed. This energy transition was not a continuous process, but different phases in the energy transition can be distinguished. Also the spatial relations between the city and its resource-supplying hinterland changed. But growth in urban resource use was not simply causing an equal growth of the spatial imprint of urban consumption. Our results show that the size and spatial location of the resource-supplying hinterland is the combined result of various dynamic processes, including transport technology and agricultural productivity. The paper shows how energy and transport revolution abolished barriers of growth inherent to the old energy regime. The research for this paper was supported by the Austrian Science Fund (Project No. P21012 G11). 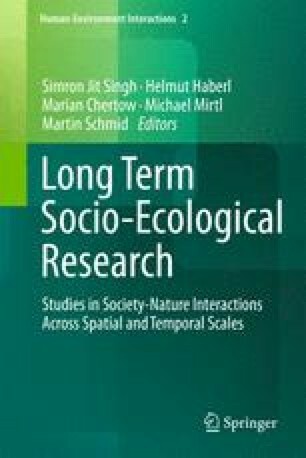 I want to thank Rolf Peter Sieferle, Verena Winiwarter, Marina Fischer-Kowalski and Simone Gingrich for their support of this research and Marian Chertow and Helmut Haberl for a critical review of the manuscript. Gingrich, S., Haidvogl, G., & Krausmann, F. (2012). The Danube and Vienna: Urban resource use, transport and land use 1800 to 1910. Regional Environmental Change, 12, 283–294. doi: 10.1007/s10113-010-0201.